This is the third instalment of Sleep Slidin’ Away. Read Part I here; Part II (It Costs Sleep to Make Sleep) here. I blame Suede. I wasn’t planning on extending my recent sleep experiment to full on sleep deprivation, and then Suede went and played in an inconvenient location on a Saturday night. By the time I’d got home and caught up on Doctor Who, I was in the midst of an accidental sleep deprivation experiment. What sort of therapist would I be if I didn’t take the opportunity for an additional experiment? A well-rested one, probably. Unfortunately, after around 6 hours’ sleep, I woke up feeling fine. Great, even. So annoying. I’d unexpectedly coped perfectly fine on 6 hours’ sleep. I did some admin, I went for a 10 mile run, I had some food, I sat on the couch. Then I fell asleep. For two hours. When I woke up again my Sleepy Brain told me that this extended nap was obvious proof that I’d got it all wrong, that in fact I can’t cope on six hours’ sleep after all. It told me that I was lucky this was a Sunday, that if it had been during the week I’d have fallen asleep in front of a client during a session. It told me that I should be worried if I’m not asleep seven hours before I need to be out of bed again. It told me that sleeping for seven hours was more important than sticking to a routine. It told me it could take me to a better, sleep-filled world where all alarms are snooze alarms. What we have here is a potentially unhelpful belief. I say “unhelpful” because it leads to worry and either restricting late night outings or having to wait until tomorrow to watch Doctor Who. I say “potentially”, because until proved otherwise, there’s still a small chance it’s accurate, in which case I probably should be worried. I have a choice. I could listen to my Sleepy Brain and accept this belief as fact based on my recent unplanned nap, or I could consider the possibility that maybe, just maybe, a two-hour run could be considered a confounding variable. If I take it as fact, I will need to make adjustments to fit this “reality” into my life. If I treat it as a theory, then I can test it out before I plan my life around something that might not actually be true. I cannot cope with less than 7 hours of sleep. Specifically, if I get less than 7 hours, I will fall asleep during the day. More specifically, if I get less than 7 hours, I will fall asleep during the day in front of a client, embarrass myself, and lose my job. Rational brain believes this prediction 20%. Sleepy brain believes this prediction 95%. I let my rational brain plan the experiment. I decided to go more extreme, because if I could get through that, my Sleepy Brain would have no choice but to accept the reality. I decided on 5 hours, which is the minimum amount of sleep I would recommend to a client doing sleep restriction experiments. This meant going to bed at 2:30am. I woke up ten minutes before my alarm after a nice 8 hour sleep. Some variation of this happened for the next few nights until I finally decided that my fear of falling asleep in front of a patient would need to be addressed separately, and I scheduled in the experiment for a Friday night. I slept for exactly 5 hours and the next day I was fine. Absolutely fine. 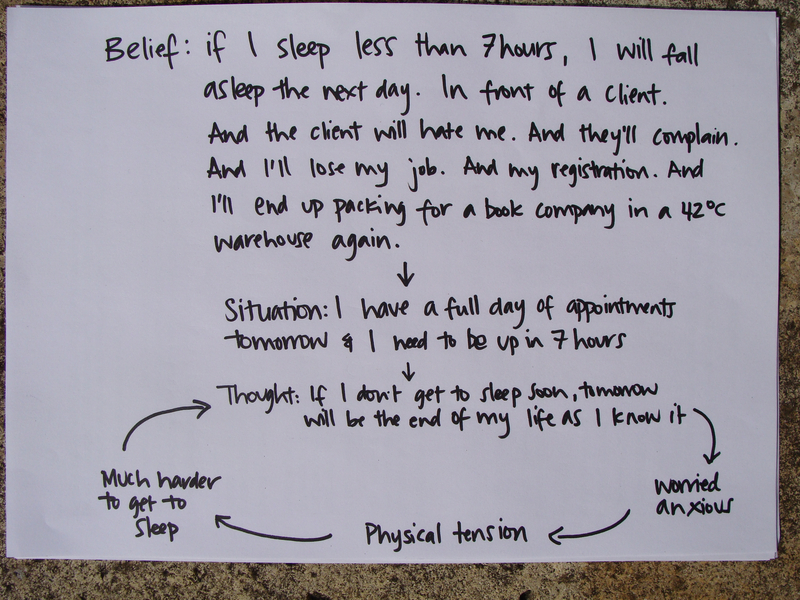 Despite this fairly hard evidence, my Sleepy Brain would not let up about falling asleep in front of clients. Rational Brain paces back and forth in front of Sleepy Brain, who is seated at the witness stand, and an unknown judge, who is asleep. Explain to the empty chairs again why you are so confident in your assertion that we will fall asleep in the therapist’s chair? We get tired after a bad night’s sleep. That’s true, we do. Go on. We unwittingly napped for two hours the other day. We have dozed off in a cinema before. Overruled. We slept when we didn’t want to. It was dark. It was Eat Pray Love. Remember that psychologist who told us she had fallen asleep during sessions? The analyst? She barely spoke in sessions. She’d seen her clients for years. Sometimes they barely spoke either. She couldn’t even see their faces. It’s not the same thing. Objection. That’s not a reasonable argument. I’m sorry but it’s how I feel. The judge emits a gentle snore. Sleepy Brain takes out a pillow and falls asleep. Rational Brain continues pacing. On Wednesday night, I slept for 5 hours. Thursday was filled with management meetings and admin, and was followed by another 5 hours of sleep. On Friday, I had five sessions of CBT. I stayed awake for every single one of them. Rational Brain sits in a large therapist’s chair and nods empathically. We see the client, Sleepy Brain, looking at a chip in the wooden arm of her chair. I guess I don’t always think straight when I’m tired. 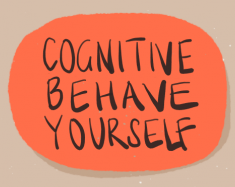 © Cognitive Behave Yourself, 2013. Excerpts and links may be used, provided that full credit is given to Jane Gregory with a link to the original material. For CBT in North-West London please visit hampsteadcbt.com.